Colby has always been a bit of a lone wolf. Her mother is dead and her father is on the road a lot as truck driver. And now her girlfriend Rachel has just dumped her for a guy, making her feel more isolated than ever. Then Colby rescues Mo, a three-legged mutt, and he exposes her up to new people and new relationships. But it's up to Colby to decide if she can risk heartbreak by being open and truthful. 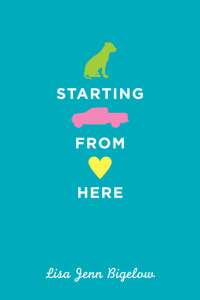 Starting From Here is a candid and endearing look into Colby's life, fears, and vulnerabilities. Bigelow shows the power that unconditional love can have through Colby’s dog Mo. He is more than a rescue dog, but a bridge to reconnection for Colby. Because of Mo, Colby meets Robyn, Mo's veterinarian and a new friend, and Amelia, a potential more-than-friend. However, it is Colby's relationship with her father that is neglected the most, and Colby's eventual cross-country journey with him is the most gratifying section of the book as she finally is completely honest about herself and her feelings. Colby learns how to bridge the gap between the person she was before her mother died, and the person she is becoming with Mo at her side, and plenty of support. Everything about this story is charming and true, and Colby's voice is extremely memorable—it’s difficult to let go of all of these wonderful characters at the close of the novel. Lisa Jenn Bigelow definitely needs to be on your author radar. Cover Comments: I like the simplicity of this cover, and the bright colors. I love that there is a truck and dog on the cover for Mo and Scarlett, Colby's red truck. Very cute! This one was great - definitely worth a special order. It sounds like a really sweet and awesome story! I liked this one a lot and am thrilled to see you spotlighting it-I think it's certainly well worth a special order and read. Thanks, Alex! And I am so glad you all agree about this book! It is so good, I don't understand why more people don't read it!